Earlier this year we won a contract with office, industrial and storage space giant Bizspace – working nationwide to regenerate and refurbish a number of their commercial properties, bringing them up to date and tying them in with the company’s new branding. 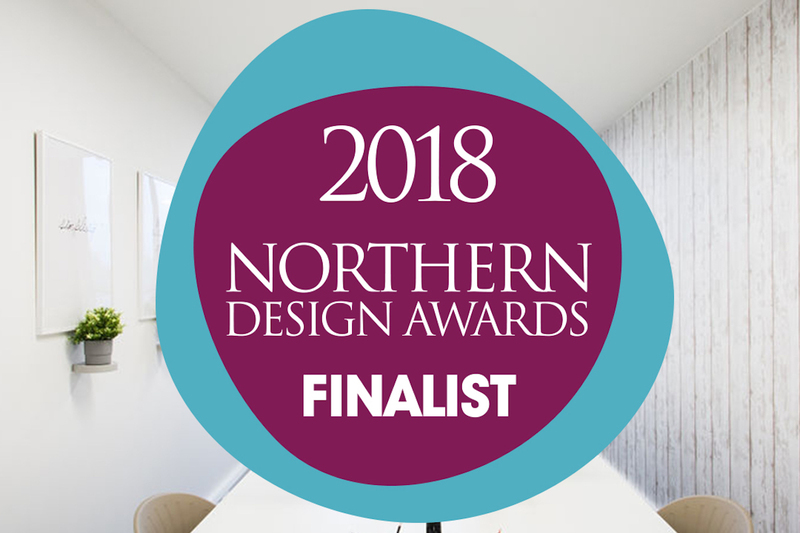 The result was an incredible transformation for an initial selection of locations – and our ongoing partnership includes designs for Gateshead, Wimbledon, Basingstoke and Newton Heath, with many more to come over the course of 2017. The first three properties Bizspace had marked for renewal Empress in Manchester, followed by Arnold Business Centre Nottingham and Atlantic Business Centre in Altrincham. Our task was to design each property individually and give each one a unique look relating to the type of building, the location and the businesses residing within. 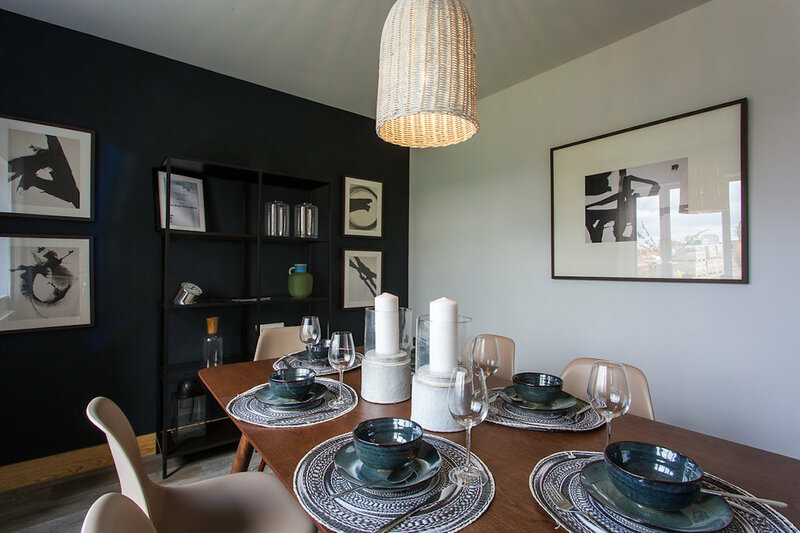 All properties had to promote a collaborative feel, express creative thinking, make the most of open space and establish a community feel. 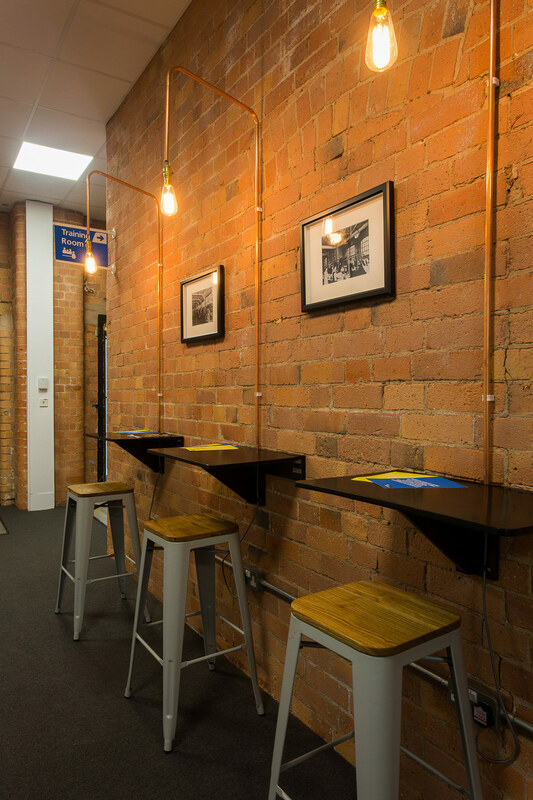 The first launch was Bizspace’s Manchester location, Empress. Here one of the first tasks included freshening up corridors, incorporating transitional spaces with large scale graphics of the city and the Bizspace branding message throughout. A pod area was also created in reception with whiteboard walls for meetings and brainstorming. Opening up the manager’s office area to reception increased visibility and made the space more welcoming overall. A contemporary feel was incorporated throughout using fresh white, grey and oak with bright colour accents in Bizspace colours within the corridors. We also designed some show offices to help sell the space. As a result, all empty units were filled within a few days of the launch – a huge success for Bizspace and the building’s brand new look. 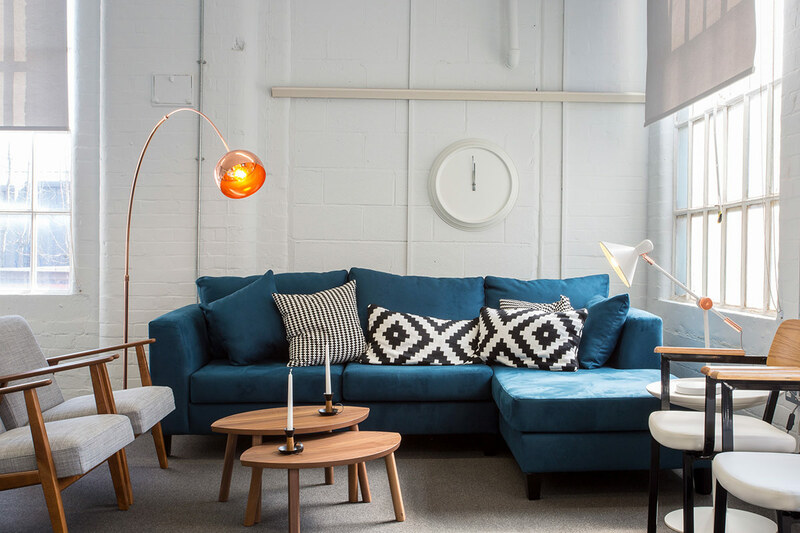 Bizspace’s Altrincham location occupies an old factory building. The traditional features of the property had been hidden by bad vinyl and suspended ceilings when it was originally turned into an office space – so our first task was reversing this to reveal the charming historical character hidden beneath. We re-instated the original features, stripping back the floor in reception and the café to the original parquet with sanding and re-varnishing. We even found original black and white tiles leading up to the reception entrance which were subsequently restored. The suspended ceilings were also removed, creating huge ceiling height in the communal area opening up the space and allowing natural light to pour through. Industrial features were exposed during this process, so we made the most of them, incorporating the utility feel they imparted into the design itself. Ceiling pipes featured in the café, which was given factory-style wooden chairs and Edison bulb feature pendants as well as painting the brick wall to complete the look. 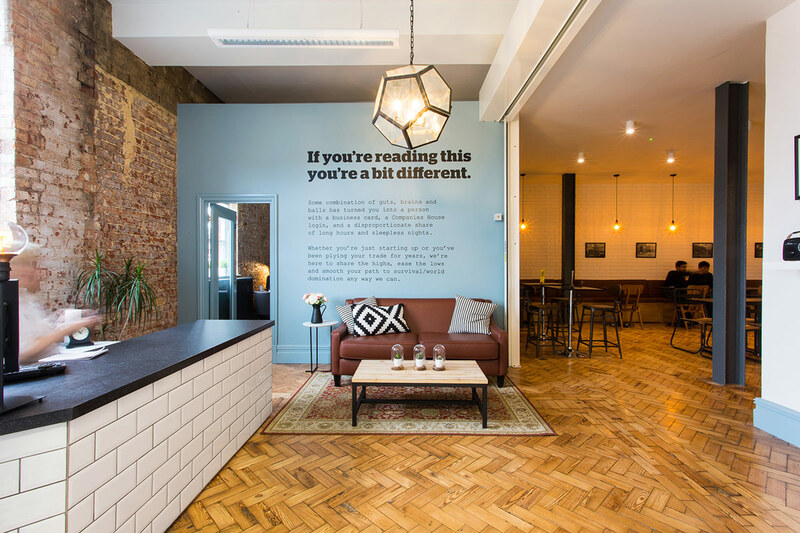 Again we took the building back to its industrial heritage by exposing brickwork in reception – perfectly complemented by an old-style leather sofa and antique rug for an eclectic feel. To add to the vintage ambience we incorporated a teal accent colour throughout and metro tiling up the stairs as a feature tying in to the industrial design. Corridors, kitchens and washrooms all got the Territory treatment, too. Whilst we wanted to make the most of traditional features the feel was to be bright, airy and open plan – so the wall between the café and reception area was removed to create a larger space allowing a feeling of community and forming a central hub for people working in the building which hadn’t been possible before. 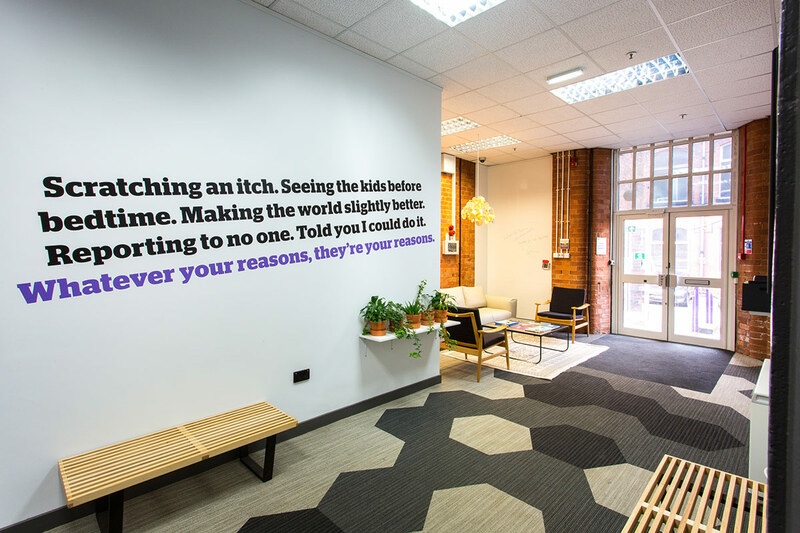 The nature of the companies that use Bizspace in Nottingham is rather varied – so design for the location needed to reflect this and had to be appropriate across the board. 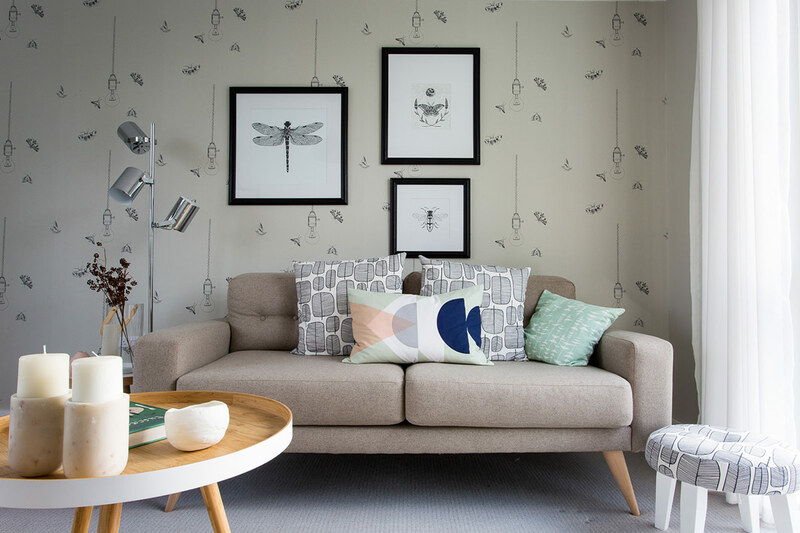 The aim was a comfy lounge feel with cool, modern styling – a versatile scheme that worked well for the full range of customers that frequent the area. To achieve this airy feel we opened up the reception area, removing the existing desk and replacing it with a welcoming waiting area, incorporating the new Bizspace branding throughout. The hexagonal carpet tiles in three shades provide a cool feature throughout the reception and ground floor corridors. New WCs and kitchens were fitted to high specification. In Nottingham we wanted to make a feature of the original building – emphasising its exposed brickwork and traditional fixtures to celebrate the history of the property. In years gone by it was an old hosiery factory – so we honoured this by creating a heritage feature sharing the stories and faces of the men who worked there and died in war. Perhaps the greatest triumph of the regeneration has been the feature meeting suite – complete with boardroom meeting table, smaller meeting area and a breakout space for socialising and brainstorming with comfy sofas and desks. Jamie Douglas, Bizspace Manager in Nottingham has already booked the meeting suite out for the year and has been very happy with the transformation. “The transformation that has taken place at our business centre has been phenomenal – completely exceeding expectations and better than we could have ever imagined. The feedback has been incredible from both existing customers and new visitors alike. We have literally sold spaces and taken meeting room bookings just off the back of the pictures alone.” Jamie Douglas, Bizspace Manager, Nottinghamshire. Following the refurbishment project we loved the design (and Bizspace) so much that we moved in ourselves! Since the revamp we have taken an office in the newly refurbished Altrincham location. You can find more information on our recent move and what Bizspace has to offer here. Have you got office or commercial space in need of a revamp? 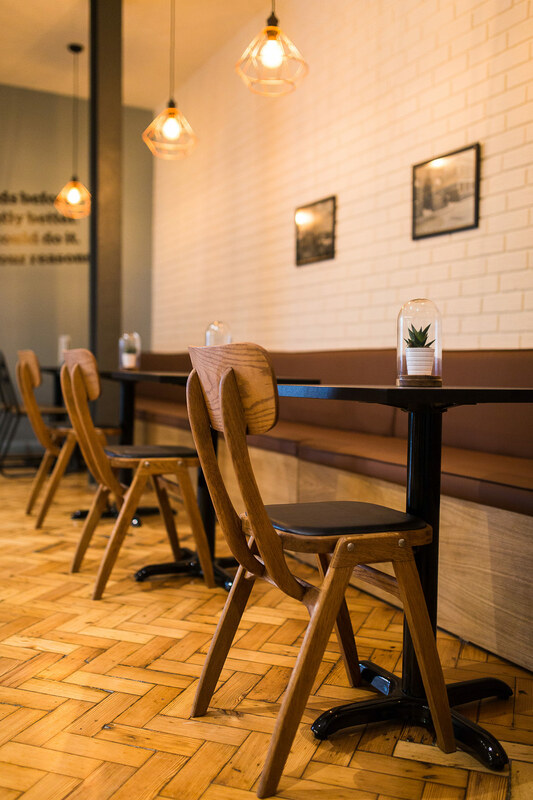 We specialise in interior design and refurbishment for all commercial applications – including retailers, corporates, property developers and small businesses. Get in touch today.